The light weatherconditions in the morning (5-10 knots West) slightly changed into a stronger NNW 10-15 knots in the afternoon. 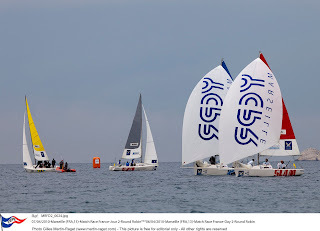 After many hours waiting for a better wind, the racing finally ended at 19:30 under heavy rain. Torvar Mirsky was THE man of the day, without any doubt. The Australian did not fail in any of his four matches. 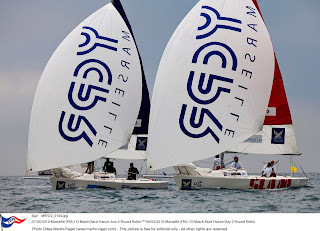 In 2009, his lightning progress made his crew reach second place on the world ranking. 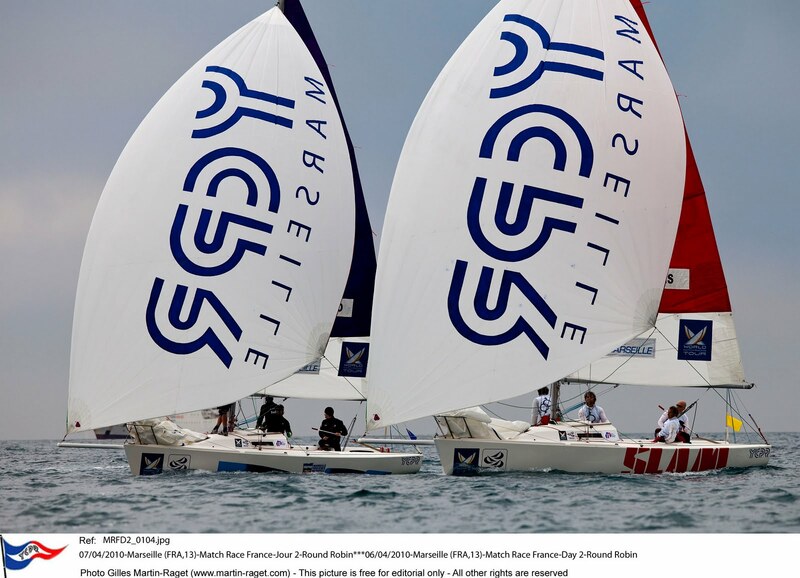 Just 23 years old, Torvar Mirsky is the youngest skipper in the World Match Racing Tour. His biggest fight of the day was against Frenchman Pierre-Antoine Morvan this morning. The two helmsmen, well known for their aggressive style, were faithful to their reputation. The light wind did not prevent them from keeping up with each other. On the contrary, Torvar Mirsky succeeded in inflicting two penalties on his opponent. 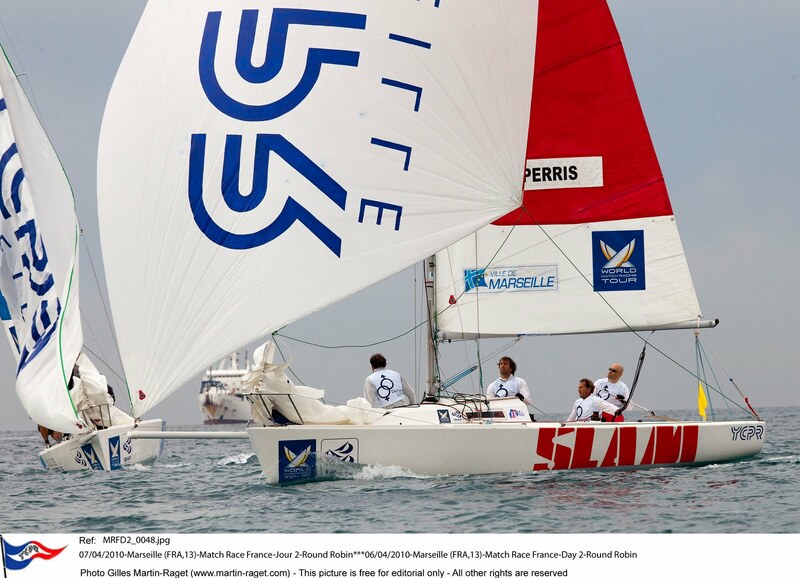 “Pierre-Antoine handles the J80 very well ", said the Australian skipper. 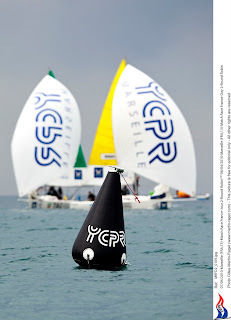 “After the 1st penalty, he managed to make up lost time but he made a little mistake at the leeward mark”. A fatal mistake… And finally everything was decided by very little things. “We were expecting a very difficult match but it all played out on next to nothing” confirmed the youngest Frenchman, Pierre-Antoine Morvan. Then Torvar Mirsky won against the two other Frenchmen with amazing records, Bertrand Pacé and Philippe Presti. He finished his day by dominating an Australian, and not just anyone: “veteran” Peter Gilmour, who is also chairing the World Match Racing Tour. Another Match Racing legend, Ben Ainslie, ended his day on a positive note after four victories and one defeat. The Englishman has been sailing with his crew for two years, but he remains cool-headed. “Each event is difficult” confided Ben Ainslie. At the Yachting Club Pointe Rouge, eyes are also turned towards Adam Minoprio. 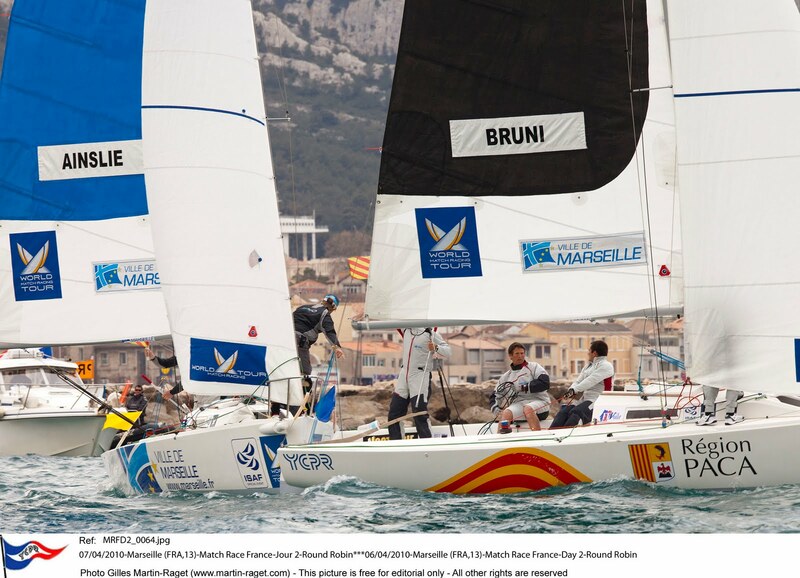 And for good reason: last year the young New-Zealander stood out in Marseilles. 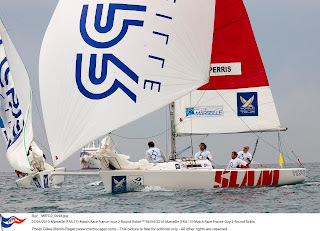 A victory full of meaning as he went on to finish first in the World Match Racing Tour 2009. But his results today are contrasted: two defeats and two victories. Everybody spoke about his lost duel against the “outsider” Gian-Luca Perris. The Monaco resident admits being the first to be surprised. “My aim was to win one match in Marseilles. I won two of them, so I have already doubled my target!” says Gian Luca Perris with humour and with a big smile all day. 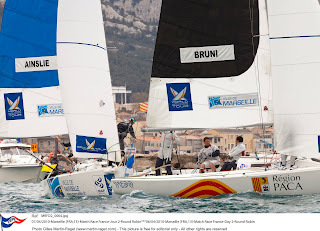 “I started skippering in match racing only three years ago”. “Regattas in light conditions are usually uncertain” commented Dimitri Deruelle, off-shore committee organiser for Match Race France. “It is where you have the biggest surprises”. It was hard to predict where the wind was going to come from next, as the conditions were so shifty, with the wind coming from west and turning into north-west. The five Frenchmen involved did not manage to succeed all the time. 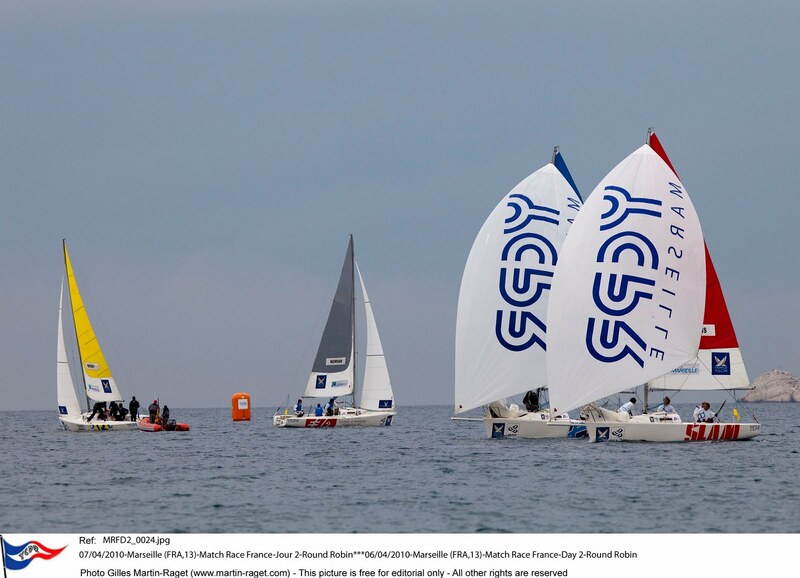 “But the main thing is to qualify for the quarter-finals” said Henry Bacchini, vice-president of FFV (French Sailing Federation). “Usually the one who arrives top-ranked from the Round Robin is not the final winner”. So nothing is over, and all twelve skippers know it. Concentration is at it's highest. Tomorrow, the first flights could be launched at 10am. A NNW 5-15 knots is announced.